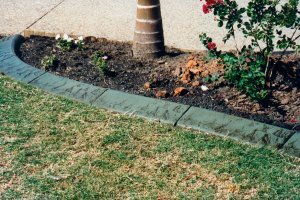 Decorative and standard concrete borders provide a durable and aesthetically pleasing custom landscape edging. 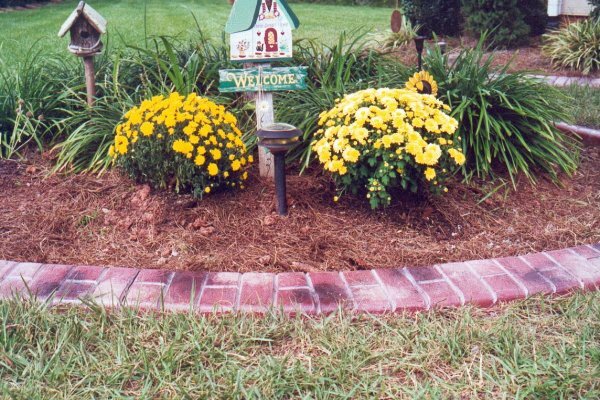 Colored or plain concrete is extruded and troweled in place to highlight or emphasize a walkway, flower garden or any other landscaping area. Various colors, stamps and textures are added for the look and feel of brick or stone. Lawn mower wheel can be run down curb, eliminating edging. Provides an attractive border for plants, flower beds, grass, property lines etc. 1) Made of reinforced CONCRETE, more durable and economical than traditional garden edging. 2) Effective root and weed barrier. 3) Will not rust, rot or break like other edging. 5) Design and color flexibility. 6) Existing landscape not disturbed. 7) Professional/clean appearance adds value to your property. Beautify your yard with stamped concrete borders. Authentic brick patterns and stone textures. Replace your old black plastic or rotting wood borders. Won't buckle, shift or rot. Many styles and colors for residential and commercial applications. Copyright 2015 Cape Concrete Designs. All rights reserved.